Local news media carried the disturbing pronouncement by World Bank economists to the effect that Sri Lanka will become an extremely hot territory with 30C temperature rise and $ 12 billion per year economic loss by 2050. Having heard so many climate scientists, including Sir Thomas Robert Watson, a former President of IPCC, who was here about a year ago, pronouncing that Sri Lanka’s per capita Greenhouse Gas emission is only a negligible 0.81 ton per year compared to the global average of 4.47 tons per year, we never imagined nor expected such a fate to be descending on us so soon. Even Prof. Mohan Munasingha, Sri Lankan Vice President of IPCC, was quoted in a Sri Lankan paper, in early January 2018 as saying that SL’s per capita GHG emission is only a very small fraction and therefore we are not a principal offender. We always thought that nature, climate change would direct its anger towards us only after punishing others emitting much higher per capita greenhouse gas quantities. 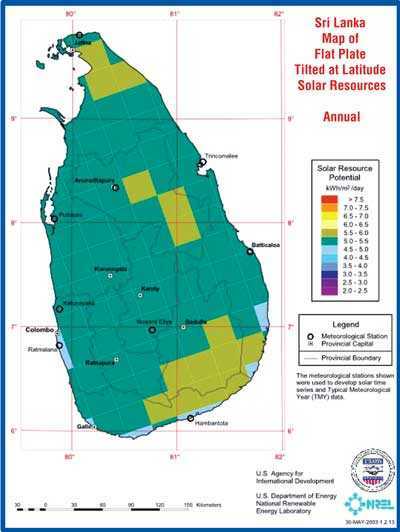 During question time at the luncheon meeting at Galle Face Hotel, where Sir Robert explained all these using graphical presentations, I stated how I saw greenhouse gas emission per unit area as a more trustworthy and relevant parameter to track, in view of Sri Lanka’s geographical position with corresponding air circulation models and after my comments, Sir Robert said that what I mentioned did sound reasonable. I also mentioned, on a lighter note, that there are no computers in the atmosphere connected to cemeteries and maternity homes to calculate the per capita values. Our annual greenhouse gas emission at 261 t/km2 (please note per unit area and not per capita) is more than three times the annual global average of 66 t/km2. This is, probably, what climate scientists, including IPCC officials, wanted to hide so that they can prompt us to use more fossil fuels than we should. They also knew that using per capita emission rate is the best way to entice thickly populated countries like China and India to use more fossil fuels. When we studied climate change, we noticed some significant aspects/differences which made Sri Lanka unique, some of which are as follows. We recognised that Sri Lanka is a small island of 65,000km2 area with 70N and 810E geographical coordinates and associated air circulation patterns – namely Hadley and Walker circulations. Our own measurements of CO2 concentration in our surroundings at Thalawathugoda indicated it is going beyond 500ppm towards 560 ppm. These findings indicated that we are fast approaching a set up characterised by a temperature increase of 2.80C above that prior to the industrial revolution. Energy we waste from transportation 30,000 GWhrs per year is more than twice what we use as electrical energy – 13 500 GWhrs per year. This is probably the highest ratio for any country in the world and mean value of this ratio for the whole world would be close to 1. We generate 172 t/km2.year of Newly-Formed Water (NFW) arising from hydrogen in petrol and diesel and this water was not in the Earth System earlier. NFW (i) when in the atmosphere is a worse greenhouse gas than CO2 and reduces wind shear leading to high winds, (ii) when coming down lead to cyclones, etc. and (iii) when on the ground results in floods, landslides, etc. Are we experiencing these today? Since we generate far more CO2 than the global average per unit area, this CO2 will increase temperature faster than the global average; this increased temperature brings about more water vapour to the atmosphere at the rate of 7% per 10C increase which additional water vapour increases the temperature further at the rate of twice that due to CO2 on a kg to kg basis or at a rate of 1.3 times that due to original CO2 emitted. This is why, we will reach that 30C temperature increase pretty soon. Is there a root cause for all this projected misery? Although there had been comparatively vague statements about Sri Lanka facing higher temperatures in the future, this is the first time three specifics have been predicted for what is in store for us. When it is due, 2050, what temperature to expect, 30C increase, and what happens to the economy, lose $ 12 billion are all specified. Just as much as what is in store for us has moved from vagueness to specificity, the time has also come for us to move from vague reasons for climate change to more specific reasons for this predicted climate change. That need to be the precursor for any tangible moves towards avoiding the predicted catastrophe. There cannot be a discussion on climate change without the words Greenhouse Gases coming into the picture. From Kiehl & Trentberth’s Energy Budget Diagram to all other explanations of climate change do talk about the Greenhouse Gases. As such we also talk about Greenhouse Gases in our explanation and we also talk about the thermal energy balances as well. We seek justification for that in the statement in CMIP5 literature to the effect that we always notice variations in thermal balances before we notice changes in the greenhouse gas flows. Even in Kiehl and Trentbirth Diagram, there is a thermal component which is derived through an energy balance approach. We have written on this previously with examples from energy flow balances including heat flows coming into the earth system and going out. It was this understanding which led us to reason out climate change differently. We always thought that climate change is primarily due to three reasons: (i) We reduce the amount of solar radiation we (a) reflect as shortwave radiation and (b) convert to chemical energy and as a result of these two changes, increase the amount of solar radiation absorbed by the earth system, (ii) we keep on generating waste energy in the form of heat energy whenever we convert one form of energy (say chemical energy in a fossil fuel) to another form (say electrical energy for the grid or mechanical energy in a vehicle) and (iii) during these processes we increase greenhouse gases in the atmosphere which will prevent the excess energy – due to non-reflected and non-converted solar radiation and waste energy generated during energy conversions – from escaping into outer space. If we look at these three reasons, Sri Lankans could be seen contributing significantly to each of them. When we build new expressways, we are reducing forest cover or vegetation. It is the forest cover/vegetation which reflect about 25% of solar radiation and convert about 8% of solar radiation into chemical energy. The forest cover also remove CO2 from the atmosphere during photosynthesis at the rate of about 21 tons per hectare per year depending on the type of vegetation. Then once we lay the asphaltic surface on the cleared stretch to build that ‘A” grade expressway we start absorbing anything from 88%-94% of incident solar radiation. And to build these highways we take a loan, which we can never pay back; we can just pay the interest. Then, we start moving fuel hungry automobiles on these expressways emitting 7.68 kWhrs of waste energy, 2.40 kg of CO2 and 1.00kg of NFW per every litre of fuel burnt by the vehicle. Then these gases CO2 and NFW start doubling the effect by preventing the longwave radiation leaving our atmosphere by their greenhouse gas effect. Last six weeks, I had the opportunity to travel along our highways to all corners of the island. 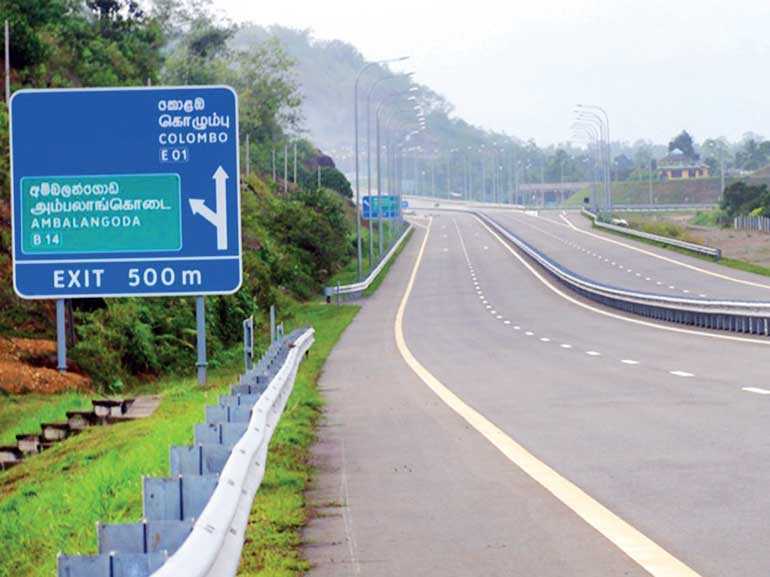 That included Jaffna, Mannar, Mullaitivu, Trincomalee, Polonnaruwa, Batticaloa, Ampara, Badulla, Moneragala and Kataragama and what I saw along those routes was A Grade, well-carpeted highways excepting a near 25km stretch from Badulla to Passara on the Badulla-Chenkaladi road. Ninety-five per cent of the time I spent on these roads, I saw nothing but roadways with about one to three vehicles on a stretch of about 1.5kms in front of me. In Jaffna and Mannar I was seeing mile after mile of these highways bounded by two, three or four lanes of large transmission poles or towers bringing in power to the vicinity all the way from Laxapana. Karainagar bridge area and Mannar bridge area come to my mind vividly. In other words, a vehicle would have covered this stretch of land called the highway only about 2.4% of the time and what were these roadways doing during the balance 97.6% of the daytime hours with the scorching sun blasting it at a rate of anything above 5.0 kWhrs/km2 day. It would have been absorbing this solar radiation at 88% to 94% rate depending on the age of the roadway. Now that we have done the damage by replacing the vegetation by a highway, the existence of the highway is not the problem today; but the solar radiation impinging on the same and getting absorbed is the problem. Similarly, vehicles traversing on the highway is not the problem, but their generation of (i) waste energy on one hand and (ii) greenhouse gases CO2 and NFW on the other hand is the problem. This understanding of the problem leads us to identify a suitable solution. We need to remember that this receipt of solar radiation is the biggest blessing we have on this planet earth and we should be smart enough to identify how we could convert its existence to be an asset even under most demanding conditions. It was here that we converted the invention of the photovoltaic solar panel to the innovation of highway solarisation which is “a new technology impacting the business world” as suggested by Joseph Schumpeter in his definition for the word innovation. Highway solarisation means laying photovoltaic solar panels above and along the highways to generate electricity to provide tractive power for battery electric vehicles plying on the highway or to the national grid. With one single stroke of intelligent imagination, we will prevent (a) solar radiation impinging on the highway and (b) vehicles emitting waste energy and greenhouse gases. The moment we combine this energy generation with the new type of tractive power for the automobile, we are disrupting an economic landscape covering more than 40% of the topmost 25 companies in the Fortune Global 500 listing. It is this logic of climate change resolution and the millions of opportunities arising therefrom which had been the basis of all our articles in the local newspapers for the last ten years. A few months back we had done some computations on the extension of Southern Expressway along these lines to demonstrate how highway solarisation could help us pay back $1.7 billion at 2% interest loan taken for that project without leaving it for the future generations to pay back and the following is a summary of the results. So one could see that this highway solarisation, if implemented above the few thousands of kilometres of highways in this country, could easily mitigate most of the damages arising from climate change, such as leading to a 30C rise in temperature and $12 billion loss to the economy by 2050 and save an approximate Rs. 478 billion to be spent on oil for transportation which hammers us in Sri Lanka than it does anybody else in the world. I wonder whether such a beneficial, pioneering project which will help mankind should be ignored for the fear of an errant driver’s car colliding with a column supporting the highway solarisation system. Now we could look at what it would do to the energy fabric of Sri Lanka. When we talk about the energy fabric of Sri Lanka, we look at it rather holistically to cover energy for both electricity generation as well as transportation. Energy fabric is what spreads the worst type of gloom over Sri Lanka’s economy landscape. It is in weaving this energy fabric that we generate an unimaginable 18,790 kt of CO2, 10,240 kt of NFW vapour and 48,766 GWhrs of waste energy. So it is the biggest culprit in taking us towards that 30C rise in temperature and $ 12 billion loss to the economy by 2050. Are we going to be mere onlookers while this destiny will befall our children in another 32 years’ time. Please note that it is not the end of the story. It is this same behemoth who took away $ 3.4 billion from our coffers and led to a current account deficit for the 20th year in succession. So now you can see what is in store for us. This is why we have been saying in Sri Lanka, energy has spelt only unbearable gloom over the economy and the environment and it is high time we reverse this trend and make energy prompt a stronger economy and an equally strong environment. The President who also happens to be the Minister of Environment, Prime Minister who holds the Ministry of National Planning and Economic Affairs and Minister of Finance should take this issue of 30C rise in temperature and $ 12 billion loss to the economy seriously and initiate action. When there is a mitigation solution along geo-engineering, energy switching and energy reduction approaches as given in sustainable energy by Prof. Jefferson Tester, should not our political and administrative establishments take it on themselves to ensure this solution is subjected to a serious study through a 10 MW Pilot Project on that 100 ft road on which we were drying paddy in 2015. That is our duty and our challenge. Anybody who is not interested in achieving this will only be an observer while the country moves towards this 30C temperature rise and $ 12 billion loss to economy. Please note that all the economic misery called a $ 2 billion current account deficit could be eliminated only by implementing highway solarisation along all highways which hold promise in respect of incident solar radiation, adequate width and straightness and there will not be any other solution for this. Any attempts at misleading the superiors by lame excuses and delaying will amount only to the estimates of 30C and $ 12 billion getting exaggerated a few-fold. A reasonably authentic pronouncement by a World Bank Economist says that by 2050 Colombo will face a 30C temperature rise and $ 12 billion economic loss and our own Climate Change Secretariat says that adaptation plans for the nine provinces will be ready by 2020. What we like to emphasise is that no adaptation plan will be adequate without mitigation plans. We have been offering our mitigation plan for climate change which could be applied on thousands of kilometres of our highways for the last eight years and it is high time we implement this on a priority basis so that we could save Sri Lanka from the impending catastrophe significantly.